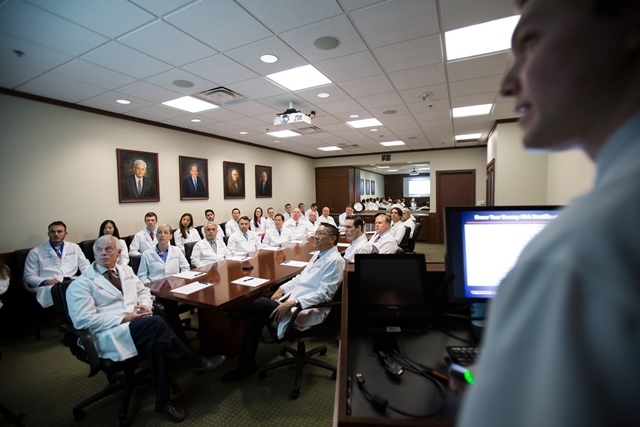 Each week the Department of Urology holds lectures and conferences to supplement Resident & Faculty education. Below is a listing of the various lectures and topics covered and the frequency of each conference. For the current monthly calendar, please click here. It is the responsibility of the first year Junior Resident to present 5-7 (on average) complex cases with GU malignancies. After he/she presents the history, the Pathology Attending reviews the appropriate slides and the Radiology Fellow or Attending describes the logical diagnostic procedure. A general discussion ensues during which the Radiation Oncologist, Medical Oncologist and the rest of the faculty participate. The conference is geared toward problem solving as well as a teaching exercise, during which time the Residents are asked to suggest or defend the proper management of the cases. The Chief Resident usually describes the operative procedure when indicated. All Residents — on the VA and Shands rotation — are required to attend. Continuing medical education, consisting of presenting the medical problems and treatment of a particular patient to an audience consisting of doctors, residents, and medical students. These lectures are given by the residents, urology attendings, and visiting scholars on selected topics. Frequently, a resident will give a lecture and the faculty will provide comments and conduct random tests on the residents’ preparation for the lecture. One faculty member hosts each month, selecting several articles related to a specific topic. The articles are selected from publications such as the Journal of Urology, New England Journal of Medicine, etc. The residents are provided the articles for review and they are discussed during the morning meeting. Our residents have the opportunity to travel to any meeting where their research is being presented. The cost of these trips is covered by the program. Additionally, nearly all residents go to the Florida Urologic Society Meeting, which is one of the highlights of the year.